I drove to Portland early yesterday. My plans being to go buy an new dress for Easter and then staying the night at a friends and going Spring Chinook fishing the next morning, early. Well, the drive was spectacular, and I drove over the hill in breathtaking sunshine and gorgeous views of snow covered mountains, the radio turned up, singing along the whole way. Made it down to the flats, and knew I should be heading to Washington Square, but somehow wound up at my friends horse barn, and got gleefully talked into going for a quick ride. Time was ticking by, but it was too much fun to pass up! OK, back on the road to Washington square. I tell you, you live at the coast for a certain amount of time, and the four lane hiways and the traffic get to you! It was dreadful, and as I passed the three exits to Washington Square I thought, NO WAY am I getting out of line just to get a dress! It was rush hour, and it just didn't appeal to me. I'll simply find a small dress shop in Lake Oswego. GI JOES? Is that GI Joes I see? OK, in my heart of hearts I know GI Joes does not specialize in dresses. But I still found myself parked in their lot! OK, I don't know how I am going to pull this off, but my dress for Easter, and the cash I had put aside to buy it, had turned into a Quantum micro rod and a brand new shiny Daiwa micro reel! It is so darling, and the rod is so whippy and mini! I simply HAD to buy it! After my day on the Lake the other day, I thought how fun it would be to fight a Coffenbury trout on this rig! I can't wait! And as for the dress.. well, I have dresses, tons of them! And you can't catch a fish with a dress, so what WAS I thinking? Chinook fishing was, well, I can't say disappointing, because it was a lovely boat ride in a brand new Alumaweld Super Vee Inboard Jet, and it was a blast going from 0 to 60 in seconds! (you know, you have to break in a new engine by varying speeds.... hee hee!) But the water was very muddy, and unless you were to hit a fish on the head with your prawn, you might as well forget it. It was fun watching the fish, and seeing sturgeon on the ultrasound screen. I was in great company, and haven't fished for springers on the Willamette since I was four years old. We let the line out till be hit bottom, and then let them sit while we cruised around. No luck, and didn't see one fish caught. I think the fish checker got a lot of sleep in her car yesterday. The sun is shining, Spring is here, and even though the rivers are closed for Steelhead now, and that usually saddens me, I feel optimistic about other fisheries that I may fall into. It's that way, you know. After steelhead closes you think, "Oh boy, no more fishing... What's a girl to do?" Then I find myself all revved up about trout, or flounder, or fishing the South Fork of the Nehalem, and I get so absorbed by it that the next thing I know it is Thanksgiving again, and the rivers are cool and clean and the air is cold and crisp, and I can't sleep or stop thinking about landing a steelie! Friday Haug Daugs or whatever it is called today on the Willamette. That means an extra day of fishing for all of you muddy water enthusiasts. At least it won't hurt the quota! Most people I know aren't even going tomorrow. Water temp is 48. The river is expected to keep rising through tomorrow. Lots of debris and low visibility. The lakes! Yes! That's the place to fish, especially if you have a new Daiwa micro reel like I do! Unfortunately I am busier than a one armed paper hanger today and through the weekend. I'm not much of a weekend fisher woman anyway. I love catching early spring bass though. That is the time to eat them! I like to go to special places I have caught them before where I know some may be nesting. I think I'll do that on Monday. Smith Lake is my favorite bass lake around here, but there is no good public access. I happen to know some good people along the lake, as I used to live there. I have cooking to do for Easter Brunch at my sisters in Lake Oswego, so I better get on it! The Easter Fish must have been here! There are little colored eggs and nests of candy everywhere! When life gets so busy like this, all I want to do is fish, and I can't. I live for my next free moment, which will be tomorrow! Then I will catch you up on any new fish news, and tell you about my fishing adventure. For now, it is egg hunt time, church, brunch in Lake Oswego, the fruit bunny with all the little nieces and nephews. (yes, it is family tradition that the fruit bunny comes and leaves oranges, bananas and baskets of strawberries out in the lawn). I can't imagine Easter without the fruit bunny. Then back home again. When I got up this morning, I thought to myself..."Yeah, this is what I wanted to do with my first bit of time off... be sick!" I have caught whatever my son David had to offer when he was sick on spring break. Fever.. the coastal crud. I have been working on the computer all day anyway, getting a super new client up. Welcome *****, expert guide with a fun bio to read. Just one of the neat things about***** is that he can take disabled guests. I can't wait to fish with him, as I think it is VITAL to fish with any guide that is on this page. You know... I fish! I have to! It's my job! What a great life! I am, no matter what, going to go fishing this afternoon. Take the kids out to run loose on the lake shore, and I will sniff, cast, wait, cough, sniff, cast, wait, cough..shiver...am I crazy? Don't answer... I have to break in my new Daiwa reel. and type in https://www.ifish.net (this page) and choose a dialect. I chose redneck, and if the server is not to busy, the results are hilarious! Like the dentist I have to go to today. Don't eat Frozen Snickers while you fish, you may break a tooth! I must be getting old, because I did! Hope the fishing is finally good tomorrow on the Willamette. Can't wait to hear. The good thing about all this waiting around for good fishing days, is that the quota is not being met, and we will have good fishing later in the year. It's just adding days on to the tail. See you on the Lake shore, I'm going out there if I am not to miserable after the dentist. Out to the lake I went! I did! I went fishing! Imagine that! I have a terrible cold and my whole mouth is numb from the dentist. But I caught fish on my new micro reel and micro rod! The only thing is, I'd have to have a micro scale to weigh them! There is, however, trout in Cullaby Lake. Let's refer to them as trout-lets. Little tiny things that go "peck peck" at your line and you feel guilty when you catch them. I released them all, of course. I always do planted trout, unless they are big and red meated and worthy of my table! Which brings me to thoughts I had out on the lake. Why is it, when I know there are planted trout in the lake that I would rather fish for something else? Something wild, and unknown? Something about planted trout fishing just doesn't excite me like when something takes my lure, and I have no idea what it is. THE LOCH NESS MONSTER.... The hunt, the mystery, the catch! Planted trout. hmmm. I dunno. It's fun, but I want a 10 lb. bass, is that too much to ask? I will learn to fly fish. I borrowed my Dad's fly fishing outfit when I was in Canby the other day, and I have been practicing in my back yard. Now for the lake experience. Look out everyone, it may turn out kind of like my ice skating experience. Looks so beautiful and graceful until I get out there and try it! Ice skating was very disheartening. Exciting news! I put an ad in the Oregonian for the Spring Fishing Guide, coming out next Wednesday, and it looks like MAYBE Bill Monroe will be writing a bit about it! I try never to count my chickens before they hatch, but I think I just did! Discussion board. I just put it up yesterday, and found Don Larson Sturgeon Site discussion board so informative, and helpful, that I was hoping we could do the same, and perhaps we could learn some things, share experiences, etc. I would like to get it active before it hits the paper. It looks very lonely right now! Anyway, out to the lake to whip some floating line around! Now how do you tie those darn knots?!! I know I may not catch anything, except perhaps the hat on the fisherman behind me. Look out, Jennies on the loose with a fly rod! I simply cannot wait to see what it is like to have a fish on a fly line! The Willamette is picking up. Water conditions are improving, and there were some fish caught. I didn't miss a whole lot though! Whew! I want to go out and fish for perch on the Columbia Jetty. I used to go out there at low tide and collect those little worms that bite off of the rocks. What are they called? Nasty little things, but great bait for surf perch. I admit, I used to use a tactic to net salmon off of the jetty that I'm not to proud of, but worked (for a short while). I HATE to net salmon off of that jetty. It's scary and dangerous! You have to dart down the rocks in between monster waves, and back up again if you fail.. repeat, repeat....So, being a single woman out there, I would go out, stand on a rock and look helpless, and ask the current fishermen, fishing on the top or bottom? Sometimes you fish with a large weight (10 to 14 ounces) on the bottom, and then have a leader with a foam bobber to get your herring off of the bottom. I would thread the herring. Sometimes though, the fish would be in schools on top, so I would fish with a float on top. Only problem with that, is the seagulls can get your bait. Sometimes I would fish on the bottom, and slide a floater down my mainline and get the best of both worlds! Anyway, if the current fishermen were on the bottom and doing no good, I would try the top. Most often I would have a fish on real soon, and I would yell in my most helpless female voice, "Help Help, I have a fish on... what do I do!?" Down the treacherous rocks they would go and net it for me! life is good! Then I would catch another. "help help....." "Thank you kind sir....."Seems I pushed it too far. I would put on a mess of line and some fish guts and haul in a couple dungenous crab... A limit of salmon and some crab for dinner. I think that did it. That and the fact that I became known out there. After some time, and recognition, I would go out there and the "help help"s seemed to be not effective. "HELLO? I said Help help?!?!" The fishermen would just turn and shake their heads. The novelty had worn thin! I had to go purchase a net with a super long handle. My "jetty netty! "It was so long that I had to duck tape it to the side of my car! It's been quite a few years since I have fished the jetty for salmon. I miss it. I think it was partially the fact that it wasn't as successful out there, and it was such a pain to get out there. It is not comfort fishing. It is a little dangerous. But it is so beautiful out there, and the waves sometimes get so high that they go over the jetty and you are right up front and personal with the strength of nature. Once when a wave came, I ducked down in the cracks between the rocks and the water cascaded over my head! Not smart, but I was invincible once! It was truly awesome, and makes me realize how small I am in the scheme of things. I want to fish on the jetty again. I rose at 5 this morning and had this strong nostalgic urge to go back to the days when I was living in Cannon Beach. Of course, that is not possible now, as Cannon Beach has changed from the once very affordable artist community, where we all hung out at Bills Tavern and talked about art shows, musicals, and the next concert we were doing at the Coaster Theatre. Now it is a mecca for yuppies, tourists, and quite reminds me of Carmel! I used to go down the streets in the early winter and know every single person on the street. In those days when I rose to the sound of the ocean crashing outside my window, I would start the coffee, and fill a thermos to take down to Elk Creek.The daylight would barely streak through the sky and I would be off with my fishing gear to listen to the birds and sit quite contentedly on the river bank waiting for hours, sipping hot coffee, but mostly just letting the cup warm my hands, and waiting for the big bite. Sometimes I would hear elk moving about in the trees.. Sometimes I would listen for different birds.. Always it felt right to be there. During jack season, I remember catching a huge one, and I was so cold, SO cold... My hands were frozen, ice on my line, snow on the banks...and I was so excited that I grabbed a stick to persuade the fish, (if you know what I mean) and hit him. It didn't phase him! I hit again, and again, and it wasn't till later that morning, when my hands unfroze that I revealed huge bruises on my left hand. I couldn't play the piano for a week.. I hadn't hit the fish. I was beating my hand that held the fish to a pulp! Well? What can I say? I'm embarrassed? I really was. Violence in the woods. There is really no more beautiful place than Elk Creek. If you go up far enough you get lost in the most amazing rain forest experience. Moss hanging from the trees, green lush. It is still quiet on the river there. Every time I pass I see no one there. What an opportunity lost for those who live there now, spending there dimes on expensive coffee drinks, and running their shops to cater to the tourists. Why don't they savor the hours before the onslaught of biz by sitting on that river bank that seems so lonely now? I guess because it is reserved for me! The forest is waiting for my return? I don't remember how many fish I caught out of Elk Creek, but I do remember that sitting on this river bank in the morning seemed to ease the ordinary stresses of young adulthood. I realize that many times I didn't fish for fish on Elk Creek. I fished for inner peace, and I still do. Chinook fishing on the Willamette should be good today and here I sit at the computer! Then off to play for a wedding, then a rehearsal, then a baseball practice. See any window for fishing? I don't! Hope they all do great out there! I'm excited for all of you who are out there with your prawns and cut herring bobbing around! Taking your son to the orthodontist for several thousand dollars does have it's benefits... I got these great tiny rubber bands to wrap around the prawns for Chinook fishing. They are great for Thill bobbers also! Blue, pink, purple... Little things like this make me smile! Fishing trinkets! If I ever get married, just give me a wedding ring spinner and I'll be happy. Tomorrow afternoon I see a small window for some lake fishing with the boys. I wonder how many trout-lets they have stocked in Coffenbury now. They are SO tiny this year! They were huge right off the bat last year. They are fun to catch for kids though. Monday after a few early morning meetings I have some time to fish, and Tuesday and Wednesday! I love to look forward to these things! Just me and my fishing gear. So many choices! Jetty fishing for the energetic? Sturgeon fishing with a guide, or by myself on the Port Docks? Bass by a quiet lake? I have no idea where my time or mood will take me! These thoughts, though, are the things that get me by. The early morning sun is peeking through the clouds, and I think it is strong enough to push them away! The air is totally still and ...what's this??? WARM?... A feeling of spring is evident! What do you think of this weather? Whee haw! Finally! Weather to bask in, to fish in, to hike in, to slow down and enjoy! Seems everything looks wonderful when the sun shines! Even if you don't catch fish! I was out at Coffenbury yesterday and the place was packed. I hiked with my friend to the other side of the lake where it wasn't so crowded. The trail is messed up from storms, so if you are not fleet of foot, don't even try it! Lots of boaters out, and some were doing real well! Had a chance to fish for sturgeon on Tuesday on T-Bay with and Don Larson, and my life is just too busy right now. Funny, it seems I write more about fishing, than actually get out there! I know I am going against my rules of life by not taking advantage of this beautiful weather while we have it, by working and not fishing. You know, in the grand scheme of things, this work is not important. I know that! Life is short! I should get out there and enjoy! I sincerely hope you take my advice, even if I can't (or won't!) Get out there! Drop what you are doing! GO fishing! "David, how would you describe the air?" My son and I were on the trails at Coffenbury Lake. We had been walking in silence for some time, and I thought I'd get his brain going. "Oh, Cool, Clean Mountain Air!" Ham. "No, David, really... It is not cool, nor a mountain here, take a deep breath and describe it to me." Silence. I thought he had given up.. But no! "Warm." Good start, Dave! "Thick" YES! "Moldy" Well... yes! "Green" He was on a roll. And all these things were true. The trail was all wet and spongy and the sun that we hadn't felt for far too long was giving the forest a tropical feel. The lake was still, the air was pungent with soggy and decaying plant life. It is Spring! It's about time! I do miss the cold clear days of Steelhead fishing. I do have Spring Chinook on the brain though. Too bad it's not shown up on the bbq yet, but I still have time! And anyway, I'm going to a friends for dinner, and having... Spring Chinook! Fishing on the Willamette tomorrow. If anyone has any reports, I'd love to see them. If anyone has a picture I would love to see that also! I'll post it! I want a Spring Chinook Pic! A picture from this season! Please?!? I would like to welcome two new businesses aboard Ifish. We have Tackle Time Charter and Bait Shop from Warrenton, and Len Self, Pro Guide. Got to visit with Linda and Gene Kane of Tackle Time while talking about their web site, and found them to be really knowledgeable, fun people. Part of the fun in fishing on a charter is being entertained by the captain. I guarantee you are in for a fun day with Tackle Time! You'll catch some big fish also! Neat people! That brings me to Len Self, who is a great guide. He fishes everywhere and knows so much about fishing that I wish I could just be around him for a while and learn by osmosis! He has experience fishing for all species of fish, on all bodies of water in Oregon. Besides that, he is a heck of a nice guy. I think he would be good with novices and experts alike. I personally can't wait to fish with him! I fished Coffenbury Lake this morning in a boat. We tried everything. Trolling with a triple teaser, bobber and worm, trolling wet flies.. nada. Well, a couple here and there. Oh yeah! This is weird. A steelhead came up to the surface and attacked Bill Hedlund's bobber! Twice! Now what would create that kind of activity? Steelhead are very aggressive, but a bobber? Makes me wonder if they are really confused. I mean you take a naturally migrating species, and put them in a semi circular body of water with no salinity and expect them to behave naturally? Nahh. Anyway, it was fun to see. salmon, but never a steelie! Beautiful weather to fish in today. A little windy, and the weirdest wind pattern, coming from every which way. Oh well, I'm sure the fishing will pick up. Anyone know if they are going to plant Coffenbury with the larger vitamin fed trout? I hope so. Now that makes trout fishing fun! Another beautiful day on the North Coast, do we ever have any different? Fishing for Springers on the Willamette is gradually picking up. A friend of mine caught one, and said it is still somewhat slow. The river has dropped and it was very windy. The east wind is blowing and that is never good for fishing. The water temperature hasn't risen as much as I would like to see. The catch was probably about as good as it was Saturday, although that is not verified information and I haven't called the Willamette Chinook Catch phone number today. Len Self is fishing the Clackamas today and I just talked to him on the river. He says the water is beautiful! I will post any results when I hear tonight. I'll never forget my most successful coho fishing season. I was really bored. It was at a time when I used to pass the days waiting for buoy 10 to open. Not so that I could go out there in a boat and dodge other boats on the water. I used to fish on the beach at Fort Steven's with all the other bank fishermen..(Yes, I am a bank maggot!) What a disgusting term! Too bad, nothing like sitting out on the beach in August, working on my tan, reading a book, and waiting for the bell to ring! Anyway, I think it was July, and it was around 1992 or so. Can't remember the exact year. There was nothing to fish for right then. I was bored, and reading through the synopsis, and it said the Warrenton Hammond line was open for Jack Salmon. In JULY? I couldn't believe what I was reading! So I packed up one day, out of boredom, and dug some frozen herring out of my freezer and went out to the end of the Hammond Jetty, and casted out with a 8 ounce weight and a herring floating above. I really didn't expect much, I was the only one out there. The regulations said you can keep 10 of anything 24 inches and under. I sat there for no more that 15 minutes and FISH ON! Brought it in, netted it and it was a beautiful 23 inch silver. Well, with the vague description of a jack, I kept it! Then I got another, and this proceeded until I had 6 for the day! HOW NICE! I went back the next day! All alone I was, and catching them again! Pretty soon a white truck pulls up. Uh oh! He came clear out there, noticed my catch, which was all strung together with a piece of old rope I had found out there. I gave him my fishing license and a copy of the synopsis to read, and he said, "Well, I don't like it, but you are right! We must have made a mistake in the manual! So for a week I was out there all alone catching fish. One day it was pouring down rain, and I remember slipping and sliding on the rocks trying to carry 6 shiny bright silvers slung together on an old rope acting as a stringer! I fell, and got bruised, cut and all beat up, but the excitement of the fish kept me from feeling anything! I was out there with waves breaking over the jetty in 40 mph winds, and miserable weather, but the fish were biting! Then I ran out of my own herring, and purchased some at Rosalee's in Hammond. The next day I went out to the jetty and it was packed with people. The news was out. But do you know what? We still ALL caught fish! It was a party!And I almost always got my favorite spot, and was glad to help other folks out and teach them my methods. I invited my Minister, Terry O'Casey out there, and told him, "Terry, they HAVE to be under 24, measure carefully!" Well, he caught and kept a 25" and the fish checker came out, and he was ticketed. I believe his perception of me was warped from then on! It was not my fault! Anyway, all good things must come to an end, and the fishing there eased up. But I had so many frozen silvers, that I had them all smoked and canned, and had a cupboard full for eating and giving away as gifts for years! This story this morning has me sorting through old pictures to see if I could find a pic of those fishing days, and I did! I'll scan it and get it out here in a bit! I also want to start monitoring Youngs Bay, since the Willamette will soon close. I have a great angle on this, because my house overlooks the bay with floor to ceiling windows, and a telescope to spy on them! Sneaky, peeky me! Yesterday I tried it out, but every time I would get perfectly focused, the darn boats would pick up and move! Of all the nerve! Back to the field glasses. I can still go down to the takeout every day at the right tide, and ask questions, and monitor fish catches! Anyway, lots to do... better get on it! I had a wonderful trip in the Nehalem Bay yesterday with Jim Erickson. We slowly went through Wizard Island, the estuary in the bay. So peaceful and beautiful. I took my boys along and we just had a great time. It is so interesting, and turned delightful for the boys when we chased some cormorants off. The guys on the bay are on constant cormorant watch, and talk with the truckers on the hiway to see if they see any cormorants up or down the bay. Then off they go, with the reports to chase them. I guess this is controversial, but they have reduced the population in the bay, thus saving thousands of smolt. The cormorants chase the smolt to the side of the bay in the shallows and then all kinds of predators are able to feed on them. The herons, the seagulls. I then went back to Jim's place and visited with his wife for a while in her garden. Wow! What an inspiration! Her planted boxes are beautiful, and the flowers are sure to be ribbon winners at the fair! Then into Jim's house for a slide presentation on the smolt tagging program, and successful management of the North Fork. I have pictures, and an article I will be posting soon on the results of the program. Nice, relaxing but informative day all the way around. Went to Sunset Lake last night, and a guy had a limit of trout-lets. 8 or 9 inch skinny little things. The bass are on the bite at Sunset. Fishing in the morning with for sturgeon. Will report the results. I could sure use the fight right now! Lost my good thill bobber on Sunset Lake bridge. Anyone who retrieves it PLEASE give it back to me! It has sentimental value! Oh well, I have the entire day without kids. I am going to do something fun! Perhaps I will hike into Lost Lake and see about the trout there. I feel like hiking. I feel like climbing Saddle Mountain, but they don't have fish at the top! I haven't climbed that mountain in years. It's so awesome at the top. So beautiful, and my life seems a little frustrating today, and the energy it takes to get there will chase some stress and negative thoughts from my mind. I also want a massage and to get my fingernails and toenails done. Yeah, right, and perhaps hop my personal jet to the Bahamas and snorkel this afternoon! I would like to drive down the coast, and check out little lakes. First things first. First there is coffee. So many choices in life. Today is mine.That sounds nice to me. I went to Coffenbury today, hiked into the back, and caught my limit of trout-lets in an hour. They must have planted again. Let me see, I think I will upgrade them to Trout-ers. They are a bit larger than the last batch. Still under 12 inches long, but a bit fatter. They fit in my pan a little better. Actually, I am freezing them for the smoker in the summer! The first one I caught I thought, oh no, little tiny baby fishes. and with each fish I caught they got bigger, and I down sized to my micro rod. FUN! What terrible news on the T.V. about the school shootings. I can't help but think that if perhaps someone were to have taught those kids to fish, this might not have happened. I know that is easy to say, but I honestly feel that way. I fished yesterday with my old fishing friend Ben. I have fished with Ben for probably 10 years or more. The days when we began fishing together were carefree and uncomplicated. I seemed to have had endless time to spend fishing, packing lunches for the kids, and sitting on the banks of fish infested waters. As we headed back from fishing the South end of Coffenbury lake, I headed down through the woods to get where we had parked, which was through dense forest and thickets with no trail. (We arrived separately.) He asked what I was doing. "Well, heading to the car, Ben! "He laughed and pointed ahead of us. Lo and behold there was a paved trail leading down to the cars! OOPS! "That's my girl!" He laughed again, and recalled the first time I met him, out on the big beach at Fort Stevens. I didn't have waders, I didn't have the right gear, I couldn't hold bottom with the swift current because I didn't have a 12 ounce weight. I had no rod holder. He continued to remind me how I didn't seem at all bothered by these things, and when I couldn't get out as far as the other guys, I simply waded out waste deep into the Columbia, in 40 degree weather, fully clothed so that I could cast out as far as the rest of them! I think he saw my determination, and adopted me on the spot. He bought me a rod holder, waders, and other necessities. He took me to Coffenbury and told me he was taking his electric motor. I thought for the longest moment, and I honestly didn't understand the concept and asked him, "But Ben, where do you plug it in?" I will never live that down! He told me he had a very long extension cord. I deserved that! He taught me the Lewis and Clark, up with flatfish and down with eggs. We ate numerous sandwiches he had created. All on white bread. Soggy fishing sandwiches, which at home would not appeal to me, but out fishing are wonderful! We froze together on icy Steelhead mornings. We sat out rain storms, ice storms in his warm pickup with hot coffee. Hot coffee with Sugar and cream. Again, not my style, but every time I get lonesome for Ben, I make some! no one else was there, and giggled as one after another fish was brought in! We couldn't even see each other due to the sand blowing, but the fish kept coming in! Miserable Joy! Ben must be pushing 85. He looks great, laughs a lot, and I feel so close to him through our rich and colorful adventures. I have been neglecting our relationship in the last few years. Not because I chose to, but because being a Mother is extremely time consuming and working trying to feed them is even more so! Nonetheless, I am reminded that there are no guarantees in life, and this relationship is important to me, and as in all friendships, they do not come free, and do require attention. The rewards and happiness I have received from my friendship with Ben are too great to let slide. I bet there is someone you need to get out there and fish with also? My server was down all night and morning, so I sat out in the sun and drew a fish. Have to do something fishy! I scanned it and put it here! Saturday is your last chance for a Springer on the Willamette. Of course, I don't have one, so no one else gets one either. Nah! Sturgeon fishing is lousy on the Columbia, but Youngs Bay was just packed today, and I didn't get out there to check it out. Mostly gillnetters. I don't even understand the season right now. I need a synopsis, and don't even have one handy. Some source of info I am! Anyway, I will treck out there tomorrow. I just forget everything business when it is sunny, and put on my swimsuit and lounge on my back deck. Can't help it. It is not often I allow myself that luxury, but it has been a llllong winter! Oh! I posted a pic sent to me by Bev, who fished the Sandy today. She sends me very informative reports of what is happening on the rivers down that way. I am deliriously happy today. I love fishing, I love the weather, I love my clean house, I love my job, I love the letters I receive from Ifish, I love the way the hummingbirds feed at my feeder, I love the flowers in the neighbors garden! Today I play "I SPY YOUNG'S BAY"
I'm going to go down there and play dumb female and talk to the gillnetters and the fishermen. O.k., in this case I don't have to play dumb, I am ignorant here. I don't know a thing about the Young's Bay fishery. So I will proceed to find out. I love being educated! I will post any findings here and on the "Jennie gets educated on Youngs Bay page," normally found at the bottom of the left column, by My 3 Lakes. By the way, Sunset Bakery is going to produce some fishing reports for us! They posted one already! Have a WONDERFUL sunshiny day! Yawn... Back to the rain... Back to sweaters and jeans..... Sure was nice to lounge on my deck in summer clothes, and soak up the sun. I even have tan lines! Something about the first sun of the year that makes me feel like a teenage sun worshipper. Bev, an e mail friend, caught a 12 lb. Springer on the Sandy! GO BEV! And thanks for the first picture I have received of this years Springers. I got all revved up thinking about fall, and the jacks I catch in a tidal overflow of Young's Bay... I'm always one or two seasons ahead. I love jack fishing. I love it when you throw your bobber out there, and stare at it, and nothing happens. You listen to the birds, and stare out into the beautiful scenery and everything is silent. Just when you get totally absorbed in your surroundings and think there is nothing possibly alive in these waters, out of the corner of your eye, your bobber moves, maybe just a tinge. Did it? You focus. All you see is the sun shining on the bobber, and the glare burning an impression in your brain so that all you see when you close your eyes that night is your bobber bobbing up and down in the water. Then it's GONE! Ho ohhhhhh! Grab the rod! GOT EM! Don't bring him in too soon! Play him!! Keep playing!! Zip zip zip! Jacks seem to hit all at the same time, so you bring him in, and cast out. Whammo, another one! I have had up to 7 jacks on the bank at a time here, still alive, because I can't stop to properly take care of them the bite gets so hot. There is nothing more fun and more giggle producing then having 7 wiggly fish surround you while you are playing the 8th! Trying desperately with all of your limbs, legs sprawled as a barrier, to keep them from going back to there aqueous destination! I arrive home with a nice stringer of fish, my hands cut up from disgorging hooks from their jagged teeth with my bare hands. Why do I do that? I guess because I have poor eyesight, and it is just so much easier by Braille! Why does my mind travel to distant fish adventures at this time of year? I long for a secret spot where there are fish that no one knows about. I drove out to this spot yesterday, thinking, wishing with all my heart, that this place would be filled with big fish, and no one knew it. The water was silent. But still, as I became mesmerized by staring at the water here, my imagination traveled to these times, and my vision of past adventures became so vivid, I had to write them down. I came home one of those days and composed this song. Then a friend wrote lyrics to it, and posted it here. The Gallery of Dreams. Kind of fun! Anyway, I guess I am a heavy line fishermen, although I was a little offended when Bill Monroe wrote that about me. It's true... I love big FISH! It is a weird feeling to know I like to fish. It doesn't seem very lady like, and I remember times catching fish, and feeling guilty for killing them. In fact I remember driving past my hole on Elk Creek the day after catching fish and keeping them, and feeling so guilty, like, "What about his brothers and sisters in the river??!! HOW COULD I!?" It's a conflict in my nature, and I don't know how to handle it. It seems to be getting stronger as I get older and realize my own mortality. Somehow though, there are some days, when I catch a fish that I just cannot possibly release. Too big, or too beautiful, or too hungry!. 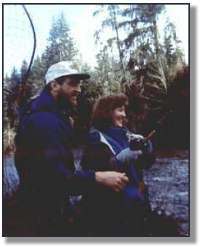 I just put together a web page on the Nehalem river. It was written by Jim Erickson and Bill Hedlund. Thanks to Bill for waxing eloquently, and helping me out with verbiage. However, he helped me over the phone, so there still may be some mistakes! Very informative, and interesting article though, and lots of pictures! The Gill nets are out on Youngs Bay again. I am going to go down to the docks and catch them this time! I missed them last time I wrote about this. I can't imagine being out there right now. Gales blowing, hail... yeah, this is spring in Oregon! I guess though, that they did not do well last time they had a test fishery. I did learn that the sports season on Young's bay, and Tongue Point is open year around. There is a 2 fish bag, and most people do well with cut plug herring and drop lead sinkers, although some use divers. There is something extremely stress reducing getting involved in this kind of work.. and IT IS work!!! So if you are interested in fort building, contact me! Hee hee! When I haven't been building forts, I have been working feverishly on web pages, and teaching piano. I am off for a couple days scouting the Sandy and the Clackamas, trying to dig up some news, and perhaps fishing a bit also. I want to talk to the local fishermen and women, and get some good stories. I can't wait! I work at home, and as anyone self employed knows, you have to get out of the house to not work, otherwise it just comes naturally during a spare moment to sit down and work! I am cursed with being one of those people who work feverishly until I collapse. And then I am exhausted for a while. Having Marfan syndrome effects me also. Anyway, I feel like I deserve this adventure! Byee! I had a wonderful day yesterday fish hunting.. I did not have a rod. I did not carry bait or lures. I drove with a friend through the country to about every boat ramp and park on the Sandy and the Clackamas. River sniffing, I guess. It was so beautiful and green. Does anyone have any idea how lucky we are? It never ceases to amaze me how densely green and lush our land is. The clouds were so dark and ominous which only added to the depth of the color. The Sandy seemed a little high, but the color of the water was awesome. Winding around all the back roads brought back so many memories of fishing trips and this is what I was after. I spent my youth on all of these roads, driving with my Dad in his old blue ford pickup searching for the perfect place to fish. It's fun, not to have to drive myself. I didn't watch road signs, I didn't watch traffic, I gazed at the wild tangle of the forest, with people's dwellings tucked neatly and privately in between, their flowering trees and gardens sparkling like someone had placed them their with a magic wand. I have been enjoying lately keeping pace with Wild talk on Oregon Live. A huge resource for people in the know. I was born a very sensitive soul, and no matter how hard I shop, I can't seem to find a store that carries thicker skin for me. I guess I will have to live with it, and sometimes I wonder if I am lucky to be sensitive, and that is why I can create music that I do. But still, it is very difficult living with hurt feelings. Especially when I KNOW I am being to sensitive, and still hurt! Anyway, I have learned a lot from this forum, and even though I can't and don't want to debate with the best of them, it's fun and refreshing to learn and stretch my brain a little. Well, it looks like a beautiful day, and I am going to go check out the lakes, as soon as I get my work done! Sturgeon continues to be slow on the Columbia here. Talked with Tiki Charters, and there are very few being caught, and even fewer being kept. I have heard of a few Springers being caught on Tillamook Bay. Rumor has it that the bigger trophy fish, (I suppose they are talking about the vitamin fed trout) are in Coffenbury, but I have yet to confirm this. I will call someone tonight and find out the scoop. Beautiful day here today. zzzzz off to a science fair with the kids. Look forward to a contest on Ifish to win a trip fishing with *******! I can't wait to get it all ready! How fun to give away a trip! I know how fun it is for me to go on guided trips! A no hassle, informative trip with a Master fisherman! WOW! I put up some really nice pictures of great catches on the Winners page. Don't know why I call it that, I guess if you got fish like these, you would call yourself a winner also! Make sure and go to the More pics page too! Nice fish and nice people!